One more project for the Rubber Dance May Challenge. How could I resist with the challenge that calls for yellow, purple and pink. I love these bright colors so I was really up for this challenge. The darling cat with the stars and moon background is a Rubber Dance stamp. I stamped the moon a second time and cut it out and mounted it on a piece of foam. That little bit of elevation really makes it pop. The purple is a Crafters Workshop hexagon stencil and purple craft paint. 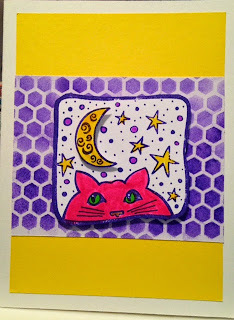 The cat and hexagons are layered on yellow card stock and then on a white card base. This was a fast and easy card. What can I say, that cat is so darn cute!! I'm linking to Rubber Dance and Paint Party Friday. My friend, Tracey Fletcher King is the spotlight artist over there this week. Be sure to check out Tracey's beautiful flowers. An awesome colour combo card :D I have that stamp too, I love it. It's very adaptable for different types of projects. Tracey's Magnolia painting is gorgeous! Lovely! Thanks for joining our challenge over at Rubber Dance! Hugs, Susanne. That´s a real good one Boo! Love the composition and contrasts.